Wills Wing offers a wide range of control bar configurations, each designed to provide the optimum balance of performance, economy and ease of use appropriate for a given glider model and its intended use. 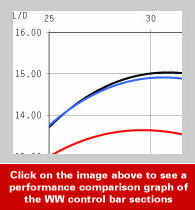 This page contains complete information on the available Wills Wing control bar designs, their relative performance, and their applicability to various glider models. The illustration of the control bar section (Fig. 1) summarizes the significant differences in effective drag area (= performance) and geometry between the older AT style airfoil downtubes and the new Slipstream and Litestream sections. The performance comparison graph (Fig. 2) shows the relative L/D performance of the three types of control bars (mounted on a Talon) at various speeds (in mph). Wills Wing was the first to introduce an economical aluminum performance downtube, the Slipstream downtube, and to integrate an interchangeable streamline aluminum speedbar option with the pilot’s choice of either the carbon or aluminum Slipstream downtubes. The Slipstream aluminum downtubes, and the aluminum streamlined basetube, each retain a very high percentage of the performance advantage provided by the more exotic carbon tubes, while offering improved durability and substantially lower cost. 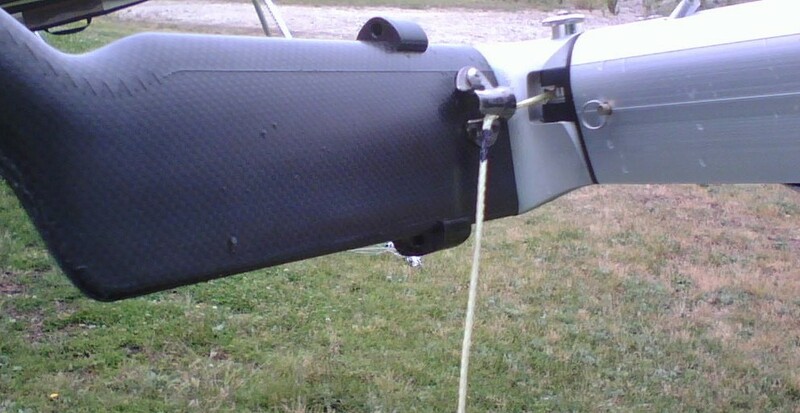 Slipstream 2 – In April 2005 we began using the Slipstream 2 control bar, starting with the new T2 hang glider. The only difference between the Slipstream 2 and the original is that with the Slipstream 2 the VG cord runs down the front of the tube instead of the back of the tube. With this change, swapping between Slipstream 2 and LiteStream Control Legs no longer requires moving the VG pulley on the keel near the Control Bar Apex. 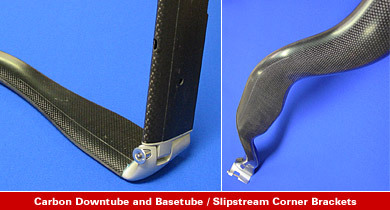 On the left side, Slipstream 2 and Slipstream downtubes are interchangeable. On the right side, where the VG cord is routed, Slipstream and Slipstream 2 downtubes are not interchangeable. WW Carbon and Slipstream airfoils are the only tubes on the market that have been independently wind tunnel tested. The complete report is available on our website. The Slipstream / Slipstream 2 Control Bar, with either Carbon Streamlined or Aluminum Streamlinwith either Carbon Streamlined or Aluminum Streamlined basetube, is the highest performance control bar available for pilots who are serious about competition or the pursuit of world records. 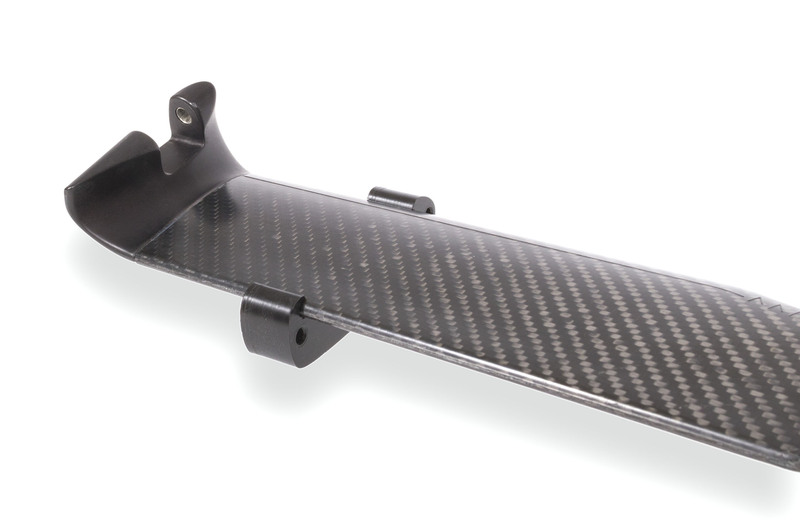 The Slipstream 2 Control Bar with Aluminum Streamlined Basetube is now standard equipment on all T2 gliders, and the Slipstream 2 Control Bar with Carbon basetube is standard on all T2C’s. 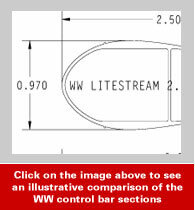 For 2003, Wills Wing released the Litestream control bar for performance oriented recreational pilots. 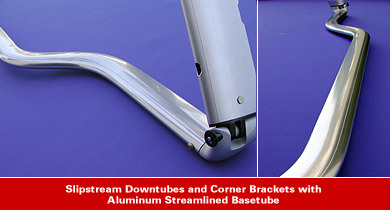 The Litestream control bar combines the same low drag aluminum streamlined basetube used on the Slipstream control bar with a slightly shorter chord, lighter weight, easier to hold Litestream aluminum downtube. Here are a few other examples of how various options affect performance as compared to the difference between a Slipstream and Litestream control bar. On a T2, the difference in performance between Litestream and Slipstream is less than the difference between coated and uncoated bottom wires; less than the difference between a tight fitting harness and a loose harness or between a Rotor type harness and a conventional harness; about the same difference of a faired instrument pod vs an un-faired instrument mounting; about the same difference made by a streamlined harness main suspension system; less than the difference between bulky clothing on your arms and tight fitting speed sleeves; and about the same as the difference between a Hydranet and a Mylar full-race T2 sail. 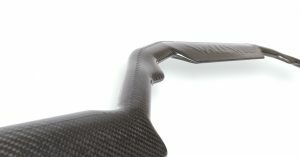 The new carbon speedbar will fit all gliders fitted with Slipstream or Slipstream 2 control bars (Talons, T2’s). A Litestream compatible version is available for all gliders that have Litestream Control Bars. 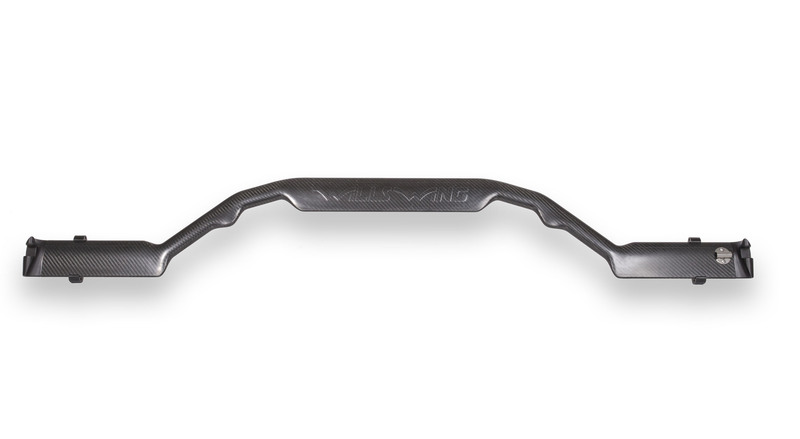 Features of the new carbon speedbar include a re-designed shape, with a deep offset planform. The grip positions are optimized for comfort, control and aerodynamics in all phases of flight. Specially designed flares in the grip area allow for effortless maintenance of optimum bank angle when thermalling. Structural features include an extra thick laminate constructed from aerospace-grade carbon and Kevlar pre-preg, cured at 230 degrees Fahrenheit and 105 psi pressure. A stainless steel internal safety cable and corner fittings machined from solid blocks of wrought aluminum (Wills Wing has never used the far less reliable cast fittings) insure the structural reliability of the basetube. 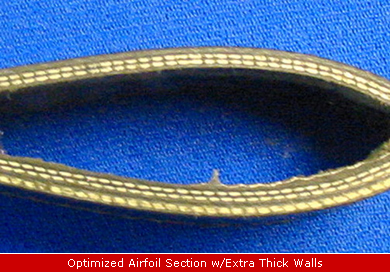 The 19mm x 77mm speedbar airfoil section is analytically optimized for minimum drag and wind tunnel tested, and includes linear and “V” boundary layer trips for further drag reduction. The new WW Carbon Speedbar is now available with Litestream-compatible end brackets as well as the original Slipstream compatible brackets. 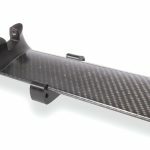 This means that you can now order the Carbon Speedbar as an upgrade on, or as a retrofit for, any Sport 2, U2, Litestream equipped T2 (or Talon), or Litestream equipped Falcon 3. 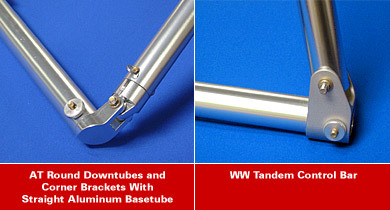 The Wills Wing Tandem Control Bar is purpose built for, and standard equipment on the Wills Wing Falcon Tandem glider.With downtubes made from stout 1.25″ diameter by 0.095″ wall tubing , and featuring specially designed, strong and durable machined aluminum corner fittings, the super-sized Tandem bar provides the ideal complement to the Falcon Tandem glider. All Falcon 3 145’s, 170’s and 195’s come standard with round downtubes and a round, speedbar (comfort bar) basetube with corner hardware similar to the Tandem control bar. 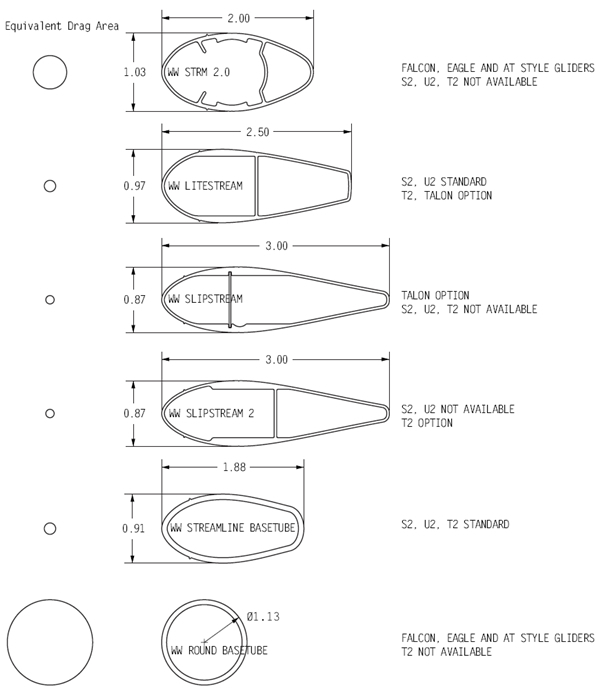 Note that these control bars are different from, and not interchangeable with AT type control bar used on earlier Falcons – see the article Falcon Control Bars Not Interchangeable for more information. This control bar configuration will accept either the 5 inch diameter Hall wheels or the 8 inch diameter Finsterwalder wheels, mounted directly on the basetube. As an option, Falcon 3 170 and 195 owners can purchase an additional Litestream Control bar kit – consisting of a complete Litestream performance control bar – streamlined downtubes and streamlined basetube, along with all fittings, that will bolt right on to the Falcon 3 using the same flying wires that came installed on the glider. The Wills Wing AT streamlined downtubes offer enhanced performance over conventional round downtubes in an economical streamlined profile. The folding speedbar basetube option shown speeds set-up and breakdown by eliminating the installation or removal of any nuts or safeties during the process. 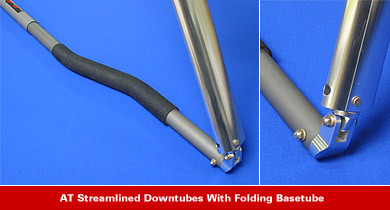 A more economical, non-folding speedbar is also available. 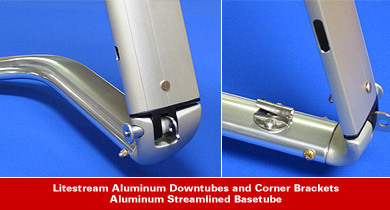 Conventional round downtubes and straight basetube offer the most economical control bar option for entry level and medium performance recreational flight.The round downtubes can be combined with either the conventional speedbar basetube (standard on the Eagle, for example), or with the optional folding speedbar basetube. 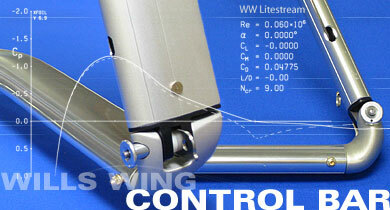 Wills Wing released the first commercially available ultra high performance control bar system in mid 1999. The Wills Wing “World Team Carbon Control Bar,” with 3.2″ chord / .77″ thickness profile carbon downtubes, featured the first high-pressure, high-temp, pre-preg composite airfoil tubes available for hang gliders. These carbon control bars added over a full point in L/D to competition class gliders and demonstrated such a compelling performance advantage that they were purchased by Moyes and Icaro for their top competition pilots. The blended aerodynamic corner fittings, machined from a solid block of aluminum, were the first application of 3D CNC machining for hardware produced for hang glider applications. Although CNC machined fittings from wrought aluminum are expensive to produce, they are both stronger and more durable than comparable castings.